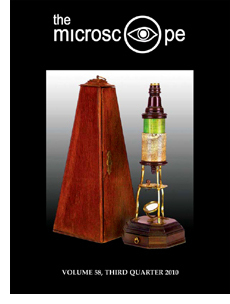 On the cover: A Culpeper-style compound microscope (circa 1730s), produced from the original design by British instrument maker Edmund Culpeper, represents the state of the art of one-lens objectives from the 18th century. See the “A Compound Microscope by Harris of London, a Classic of the Pre-achromatic Era” abstract by Jan Hinsch from Inter/Micro 2010. Abstract: Head hairs from a 19-year-old female murder victim, who had been buried for 36 years, were examined by scanning electron microscopy (SEM) and transmitted light microscopy. The hairs exhibited a range of biodeterioration artifacts. In some areas on the hairs, the cuticular scales were intact; in others, scales had become loosened; and in yet other areas, scales had been completely lost, exposing the underlying cortical cells. Three different types of fungal tunnels were observed: thin, thread-like tunnels; conical tunnels that narrowed as they penetrated the shaft of the hair; and conical tunnels that increased in diameter as they penetrated the hairs. These fungal tunnels are consistent with the growth of both keratinophilic and keratinolytic fungi.